Linehalt is a fiend/knight-like Bakugan, and Ren Krawler's Guardian Bakugan in Bakugan: Gundalian Invaders. Linehalt is partners with Ren. Bonded tight as family, they share both their memories and fierce dreams. Linehalt is an exceptional young warrior who has lived in the underground of Gundalia. Using the stone in the palm of his hands, he absorbs and nullifies the attacks of his enemies. He has a "Forbidden Power" in the Anime. His main Battle Gear is Boomix. 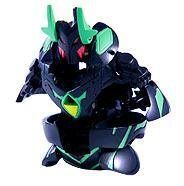 Purchase your Linehalt Bakugan from Amazon now!